The Jilkaat Kwaan Cultural Heritage Center and Bald Eagle Observatory sits in the heart of the Chilkat Bald Eagle Preserve (CBEP). 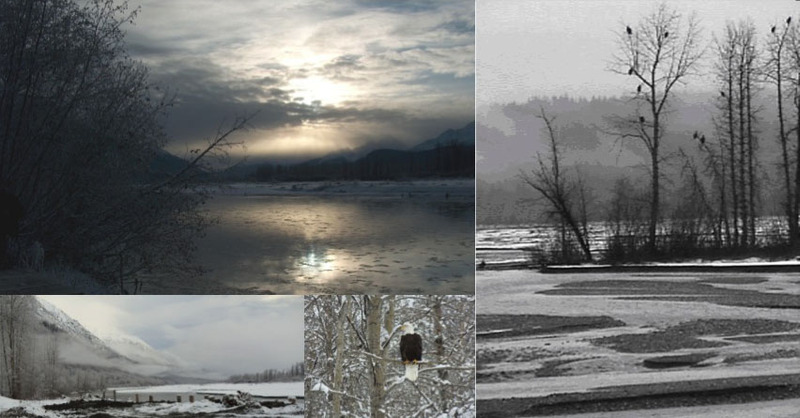 The CBEP covers about 23,000 acres of the Chilkat Valley and it attracts 3,000 to 4,000 Bald Eagles in the winter months. There is a substantial number of Bald Eagles that stay all year in the Chilkat Valley but the largest gatherings occur between the months of November and March. The community of Klukwan and the Heritage Center facility is surrounded by the “Council Grounds” which has the largest concentrations of these majestic birds. The jagged peaks of the Chilkat Mountain range are situated just opposite of the village of Klukwan and they, combined with the river flats and the wildlife, offer some of the best scenery in Alaska.